If you thought homestays in India were very modest, then think again! No, you don't have to share a bathroom with the host family or sleep on the floor. In fact, you can enjoy some of the best accommodations that India has to offer. And, on top of this, you get to feast on delicious home cooked food and receive personalized attention. If you've ever experienced famed Indian hospitality, you'll know what a treat this is. While India has some magnificent homestays, there are a few that stand out in terms of facilities, location, and hosts. Villages, royal residences, forts, and the tranquil backwaters of Goa and Kerala are just some of the mesmerizing settings where you'll find homestays in India. But what's really special are their unique features -- guests can experience everything from organic farming to Turkish steam baths! Learn more about the Benefits of Staying at a Homestay. For a really memorable vacation, take a look at these exceptional homestays in India. There are bed and breakfasts, and then there's Sunnymead. At Sunnymead, you don't just get a bed, you're welcomed into an exquisite Colonial-style ancestral property with rambling English cottage garden. And you don't just get breakfast, you're given an unforgettable gastronomic experience. Undoubtedly, Sunnymead is a rare property in Shimla. An ancestral home, it was restored and converted into a bed and breakfast in 2011. Inside, it's full of family treasures that blend in beautifully with the contemporary touches that have been added. The guest accommodations occupy the whole top floor. There are four bedrooms, all with ensuite bathrooms. Just like the rest of the house, the bedrooms are gorgeously decorated in classic style with contemporary accents. The highlight of the main guest room is a solid wood four poster bed. Activities: Reading books from the shelves, nature walks, bird photography. Special Features: The gourmet food at Sunnymead is on par with that of a fine dining restaurant. It's prepared using fresh ingredients from the garden. Rate: 6,000 rupees per night for a double and 4,500 rupees per night for a single. Find out more about Sunnymead or read reviews on Tripadvisor. Technically, The Homestead at Corbett is a homestay. However, the luxurious accommodations and excellent facilities make it feel more like an intimate resort. The understated approach to The Homestead gives nothing away about this property's magnificence. However, when you arrive, it's imposing enough to take your breath away. The Homestead is the perfect place for some well deserved pampering. Alternatively, if you're feeling adventurous, the great outdoors and farm life are waiting to be experienced. Activities: Bullock cart rides, a trip to the fields, milking the cows and tending the poultry, star gazing with state of the art telescope, day trip to Corbett National Park, fishing, camping, elephant rides, nature walks, barbecues and bonfires. Special Features: The expansive grounds, swimming pool, and spa pavilion with Turkish steam bath and gymnasium. Rate: 6,000-8,000 rupees per night, for a double including breakfast. More information is available from the Homestead Corbett website. The Bangala, Tamil for "The Bungalow", is a stately heritage bungalow that dates back to 1910. In its earlier years, it was mainly used for entertaining VIP guests. The Governor of Madras, Sir Arthur Hope, visited in the 1940s. All the furniture, cutlery and crockery used by him is still there today. The property later became a club, a venue for formal tea and dinner parties, and site for tennis tournaments. It was restored to its former glory in 1998 and converted into a heritage homestay by the owners in order to preserve it. The property has a convenient location in Karaikudi, in the heart of the Tamil Nadu's Chettinad region between Tanjore and Madurai. There are 25 air-conditioned guest rooms, banquet hall where elaborate Chettinad cuisine is served on banana leaves, a library, and swimming pool. Activities: Visiting elaborate Chettinad residences (ideal for architecture lovers), visiting local villages and markets, and shopping for antiques, fine furniture, diamonds, saris, and famous Chettinad tiles. Special Features: Fabulous for foodies, the homestay offers seven course meals, cooking demonstrations, kitchen tours, and special packages for the exploration of local cuisine. The owner and host, Meenakshi Meyappan, is passionate about preserving Chettinad culture and has even co-authored a book on authentic Chettinad recipes. Rate: Double rooms cost 7,000 rupees per night. Meals are extra. Visit The Bangala website, or read reviews and compare prices on Tripadvisor. As its name suggests, Kannur Beach House is located at one of India's top off the beaten track destinations, Kannur, in remote northern Kerala. It's a century-old, traditional Kerala-style home, set in coconut groves next to a small freshwater lagoon and just a couple of minutes walk from Thottada beach. This simple and sweet homestay is the perfect place to relax and unwind seaside. The hosts serve delicious local Kerala vegetarian cuisine and are a wealth of information about the region. Activities: Swimming, boating, bird watching and walking. The homestay also organizes visits to theyyam performances (from October until May), the hand-loom weaving center, and other attractions in the area. Special Features: Rooms with balconies and sea views by a private stretch of beach. Rate: 3,400 rupees per night for a double, including breakfast and dinner. Visit the Kannur Beach House website or read reviews and compare prices on Tripadvisor. For a luxurious and authentic royal experience, look no further than Shahpura Bagh. Set on 45 acres in the vast Rajasthani countryside, midway (five hours) between Udaipur and Jodhpur, this remarkable property was the summer residence of the rulers of Shahpura. These days, it's a working farm estate resplendent with neem, ashoka, peepal and mango trees, cows, peacocks and other birds. There are two residences on the estate -- the 19th century Nahar Niwas, which remains the family home, and Umaid Niwas. Originally built as a guest house for visiting nobility, Umaid Niwas has been restored with six suites and all the amenities of a premium hotel. The suites are elegantly decorated with period antique furniture and royal paintings. The family consists of the present raja (king), his two sisters, two nephews and their wives and children. They happily interact with guests and regale them with stories. Activities: Expeditions to neighboring forts and temples, safaris, exploring the local area, nature trails, birding and boating. Special Features: Royal hosts, secluded infinity pool with two pavilions featuring huge daybeds. Rate: From 13,000 rupees per night (low season) for a double suite, one excursion, sundowner, and breakfast. Read reviews about Shapura Bagh on Tripadvisor or visit the Shapura Bagh website. Olaulim Backyards is a haven of a homestay where you can really get back to nature. The homestay is located on the Goa backwaters in Olaulim village, around 30 minutes from Panaji, the capital of Goa. It's run by a Finnish-Indian couple, who live there with their two children and menagerie of pets (three dogs, one cat, two goats, and a naughty donkey). The couple have added three delightful cottages, unique in size and decor, to their property for guests. The cottages are all situated in different levels of the foliage in the backyard, and are blessed by views of coconut groves, paddy fields, and the swimming pool. Although the cottages are rustic in nature, they're not short on comfort. The bathrooms are particularly memorable -- built in tropical in style, they're partly open air so you can shower under a vista of Goan sky and towering trees. Activities: Swimming, kayaking, fishing, canoeing, cycling, nature trails, bird watching, as well as visiting the local tavern for local gossip! Special Features: The opportunity to immerse yourself in nature, away from worldly distractions. Rate: 4,500 rupees per night for a double from October to May, and 4,000 rupees per night from June to September. Breakfast and all in-house activities are included. Read more About Olaulim Backyards and See Photos. Visit the Olaulim Backyards website. Can you imagine a totally harmonious retreat, surrounded by still water on three sides, which is a real escape from the rest of the world? The incredible thing is that it doesn't have to remain in your imagination because it's real! Vembanad House, on the banks of Vembanad Lake along the Kerala backwaters, is such a place. Vembanad House is an old ancestral home that has been lovingly restored by the hosts. The interior is filled with some beautiful pieces of traditional wood furniture and artifacts, while the exterior is lush with tropical foliage and paddy fields. Activities: Cooking lessons, fishing with locals, walking through the paddy fields, shopping in local markets, open air dining, traditional dance performances, Ayurvedic massage, house boat trips along the Kerala backwaters, bird watching, tours to learn about the coir industry, and yoga classes. Special Features: The secluded location on the banks of Vembanad Lake, and option to go night fishing and catch your own seafood. Rate: 7,000 rupees per night, for a double including breakfast. See 8 Best Homestays on the Kerala Backwaters or read reviews and compare prices on Tripadvisor. More information is available from the Vembanad House website. Having an authentic Rajasthani village experience is becoming a popular thing to do in India, and Chhotaram Prajapat's Homestay offers amongst the best. This homestay, belonging to an enterprising family of weavers, is situated in Salawas village on the outskirts of Jodhpur. Special Features: The accommodations are built in the style of traditional village huts. Rate: 2,500 rupees per night, for a double room including breakfast. Visit Chhotaram Prajapat's Homestay website, or read reviews and compare prices on Tripadvisor. Devra homestay could well be described as a colonial style farmhouse with a focus on a natural and organic lifestyle, 10 minutes away from the city of Udaipur. In the local language, Devra means a tribal temple and the host family’s temple by the house is worshiped in by the local villagers. The landscape around Devra is striking. Panoramic views of hills and farmland stretch in every direction, reaching all the way to the City Palace itself. Window seats in the guest rooms each have a view of the mountaintop Monsoon Palace. The entire house is tastefully decorated with spacious sitting areas, balconies and terraces. Activities: Trekking in the Aravalli ranges, cycling (bikes are provided), village walks and temple visits, bird watching, yoga classes, painting, gardening, interacting with farm animals, and sightseeing in Udaipur. Special Features: The experience of organic living, including meals prepared with home grown organic food. Those who wish to discover more about India will also be interested in the host's vast collection of books on the subject. Rates: From 5,500 rupees per night, for a classic double room including breakfast. Visit the Devra Homestay Udaipur website or read reviews and compare prices on Tripadvisor. Fort Rampura homestay has to have one of the most spectacular settings in India -- in a 700 year old fort that speaks plenty about the bygone era. The village of Rampura, in the Jalaun district of Uttar Pradesh, doesn't feature in any tourist books. This enables visitors to have a very authentic experience indeed. Despite the vastness of the property, the homestay has only three guest rooms. This leaves so much more to be discovered. You can spend countless hours just exploring the wonders of this imposing Fort, including the many living rooms that house countless unique and priceless artifacts, rugs, and furniture. Activities: Bonfire, games room, library, open-air dining, photography, picnic by the River Pahuj, boating on the Yamuna River in the hosts' personal boat, attending village fairs and markets, visit to the family temple, and walks through the fields and Fort. Special Features: An off the beaten track location and a unique historical setting. Not just out of the way, it's also out of the ordinary! Rate: 5,000 rupees per night, for a premium double room including breakfast. Visit the Fort Rampura Homestay website or read reviews on Tripadvisor. Thippanahalli Homestay is a substantial red mansion with 28 rooms, located around 15 kilometers from Chikamagalur, in the fertile coffee district of southwest Karnataka. The mansion is a heritage plantation bungalow, built in 1934, and the hosts come from a long line of planters. They've been growing coffee in the district since 1860! The hosts decided to open their home to guests as they missed the extended families that they grew up in, and thought it would be nice to have other people visiting and sharing their home. There are five guest rooms. One of them is in the mansion, while the other four are in separate cottages on the property. Two of the cottages have been refurbished, while two are newly constructed. Activities: Coffee plantation tours, trekking and driving in the mountains, golfing, bird watching. Special Features: The mansion has a fine collection of rare paintings, artifacts, chandeliers, carpets, dolls, and antique furniture that's been collected over five generations. The garden has a huge cactus tree that's more than 50 years old. Rate: 6,200 rupees per night for a double in the mansion. 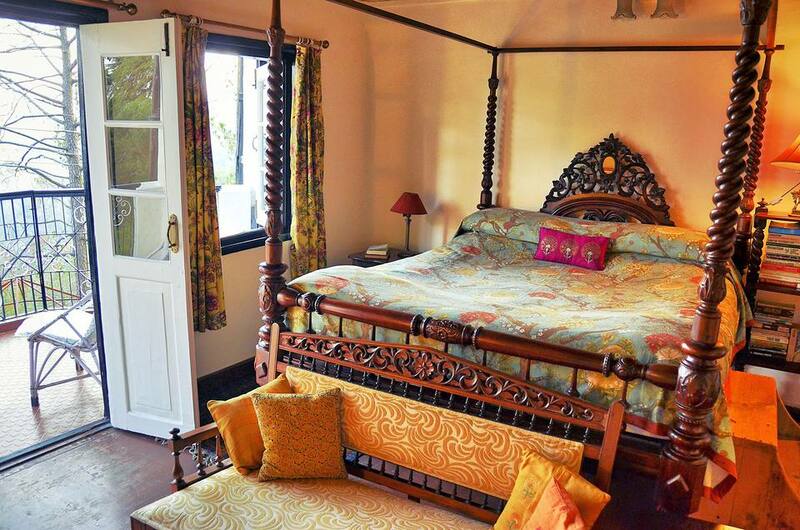 5,200-6,200 rupees per night for a double in the cottages. Visit the Thippanahalli Homestay website, or read reviews on Tripadvisor. Red Hill Nature Resort occupies a private position in the untouched upper Nilgiri mountains, around 30 kilometers from Ooty and more than 7,000 feet above sea level. The road there will take you through lush countryside and picturesque villages, and past vast tea gardens -- and more unusually, fields of cabbages and carrots. The very peaceful property consists of a carefully restored heritage bungalow, built in 1875, with mesmerizing lake and mountain views. It's situated on a 250 acre tea garden, and the hosts are expert tea growers. There are eight elegant Colonial-style guest rooms in the bungalow and separate cottages. All have verandas, and most have their own fireplace and bathtub. Activities: Trekking, fishing, camping, bird watching, mountain biking, visiting local tribes, and daily yoga. Yoga themed tours of south India are offered. Special Features: A traditional kitchen with wood-fired stove and family recipes handed down from generation to generation (most of which cannot be found anywhere else in India). The homestay also has cows, chickens, and a garden that grows organic seasonable vegetables. Rate: Expect to pay 7,000 rupees per night for a double, including all meals. Visit the Red Hills Nature Resort website, or read reviews and compare prices on Tripadvisor. A patch of paradise only a couple of kilometers from Gangtok, the capital of Sikkim, Hidden Forest Retreat is a haven for people who love privacy and nature. Spread over three acres, it's full of flowers, fruit trees, and forest. The homestay is an extension of the host family's 40 year old orchid nursery, which remains the heart of the property. It was opened to guests in 2003 and is predominantly managed by daughter Kesang, a graduate of horticulture. Her parents help with receiving guests and showing them around. There are 12 spacious guest rooms with balconies overlooking mountains and paddy fields, and an extensive library. Vistas of Rumtek Monastery, Rani Khola (river), and Gangtok town can be seen from the veranda. Activities: Nature walks and trekking, local sight seeing, tour of the nursery. Spring (March and April) is the best time to visit if you're interested in flower viewing. However, you'll encounter blooms through much of the year. Special Features: The entire property is connected by stone paved pathways that lead through dense forest and the orchid nursery. Food is organic and served fresh from the hosts' garden. They even have a cow that provides milk. There's no fixed menu. Rather, local delicacies are prepared according to guest preferences. In the evenings, locally brewed chaang (alcohol made from millet) is offered on the terrace. Rate: Expect to pay 2,500 rupees per night upwards for a double. Visit the Hidden Forest Retreat website, or read reviews and compare prices on Tripadvisor.